Cumbernauld United had to fight hard to get three important league points with a 1-0 win at Shettleston on Saturday. United had the advantage of a very strong wind in the first period but it was Shettleston who almost took the lead in the seventh minute. Richard McIntosh’s shot from the edge of the 18-yard box hit an upright and, fortunately for United, rebounded clear. Although the visitors were doing all the pressing it was McIntosh again who brought out a fine save from Graeme Murphy in the Cumbernauld goal when the home forward’s attempt at goal was turned round the post by the United keeper. On the half-hour mark United came near when a Chris Lennon cross was headed just past by Aiden Malone. Then a Davie Dickson effort was fumbled by home goalkeeper Dylan Caddis but luckily for the home men it hit a post and was scrambled clear. A Paul McMenamin header from a Robbie Winters ball also caused problems for the Glasgow team right on the half-time whistle. United had a great chance to take the lead in the 53rd minute when they were awarded a penalty for handball against Shettleston’s Robert Campbell. But Robbie Winters’ spot-kick was parried by the Shettleston keeper and Winters, following up, only managed to smash the ball against the bar. A United opener was not long delayed, however. 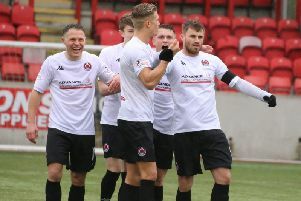 A Paul McMenamin free-kick caused confusion in the home defence and Aiden Malone was at the back post to head his first goal for Cumbernauld. United were now showing better form and looking to increase their lead. Lennon was upsetting the Shettleston rearguard with his strong running and when he was grounded by Campbell, Paul Murphy’s header from the resultant free-kick cleared the bar. United substitute Fraser Team then caught the eye in the 85th minute when his powerful drive hit an upright only to rebound fortunately into keeper Caddis’s arms.